Have you ever wanted to hook up a MIDI keyboard to your iPad and jam out in style with Garage Band? It's actually rather easy to connect a MIDI controller to your iPad, but you will need an adapter to let you funnel that MIDI signal into your tablet. Luckily, there a couple of not-so-expensive options. 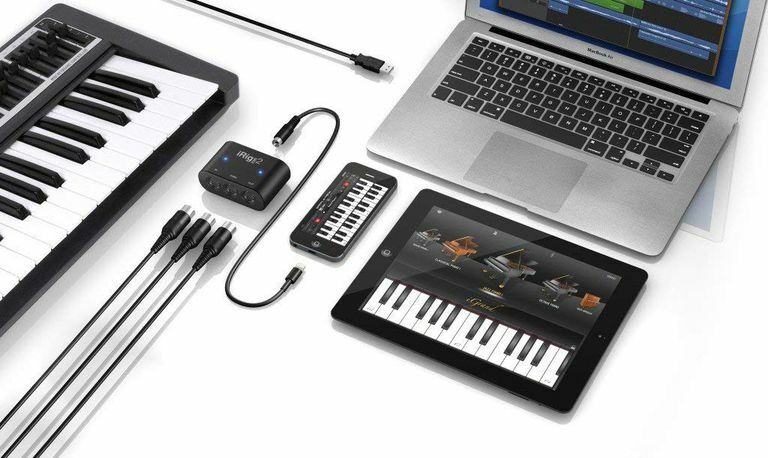 The iRig MIDI 2 is the most expensive MIDI solution for the iPad, but it is also packed with features. The adapter provides MIDI in, out and thru using the standard MIDI interface. The iRig MIDI 2 also has a USB port, so you can keep your iPad's battery from draining down while you play. This makes it an excellent choice compared to other solutions. If you can't keep your iPad charged, your playing time will be limited. And if you walk into the studio only to find your iPad's battery mostly drained, this is the solution that will still let you sit down and play. iRig MIDI 2 also works with all generations of the iPad or iPhone. Next up comes the iPad Camera Connection Kit, which essentially turns the Lightning connector into a USB port. One thing to remember when using the connection kit is to plug any MIDI controller into the connection kit first and then plug the Connection Kit into the iPad. This will help the iPad recognize your device. While the Connection Kit doesn't have the musical versatility that comes with the iRig MIDI 2, it does have non-musical versatility. Since it is essentially a USB port, you can use it to load pictures onto your iPad from a camera or even connect a hardware keyboard to your iPad. This solution is great for those simply trying to create a simple MIDI connection. The Connection Kit is available for iPads that have a Lightning connector and older iPads with the 30-pin connector. Because the iPad may not output enough power for your MIDI controller, you may need to connect your controller to a USB hub and the hub to the iPad via the camera connection kit. While less expensive than the iRig MIDI, the Line 6 MIDI Mobilizer II doesn't offer the MIDI thru or the USB connection for keeping your iPad charged. If all you want to do is get MIDI going between your iPad and PC, this will do the trick for the smallest amount of cash, but without the ability to keep your iPad charged, your playing time will be limited.